Under the rubric of “Community” we discussed the special role that birds play in the culture and cosmovision of the Q’eqchi’ Maya, see Q’eqchi’ Ethnoornithology. 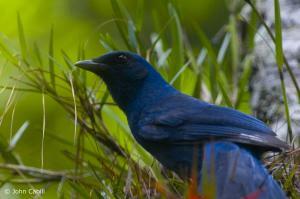 Birds also play a special role in the ecology of cloud forests. 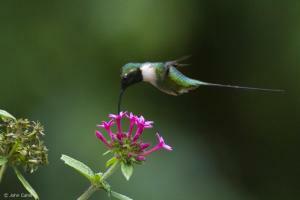 Birds are both harvesters and planters of cloud forests. 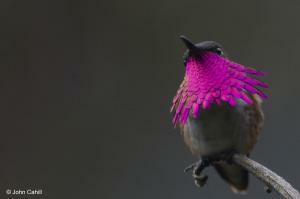 Birds keep insect populations at bay. 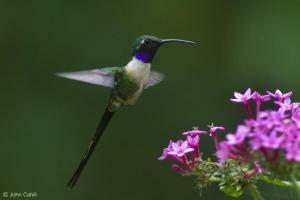 Birds compose the soundscape of the cloud forest. 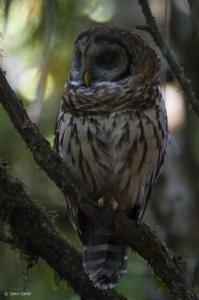 Their songs and calls echo through the dense mid and understory of the forest. 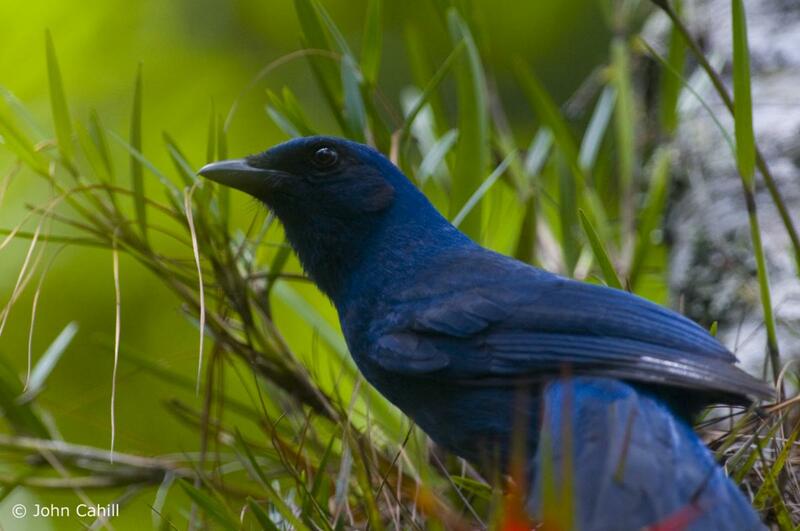 Without the sounds and songs of birds, these forests would feel abandoned and empty. Far beyond what birds do for cloud forests we can only begin to imagine what cloud forests do for birds. 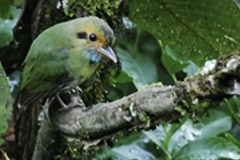 Cloud forests sustain an impressive diversity of endemic and near endemic species. 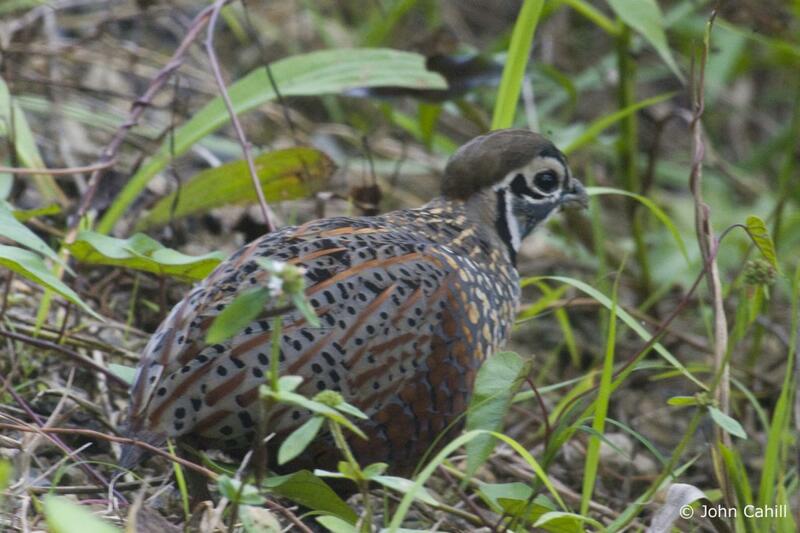 These forests provide a safe haven for wintering birds. 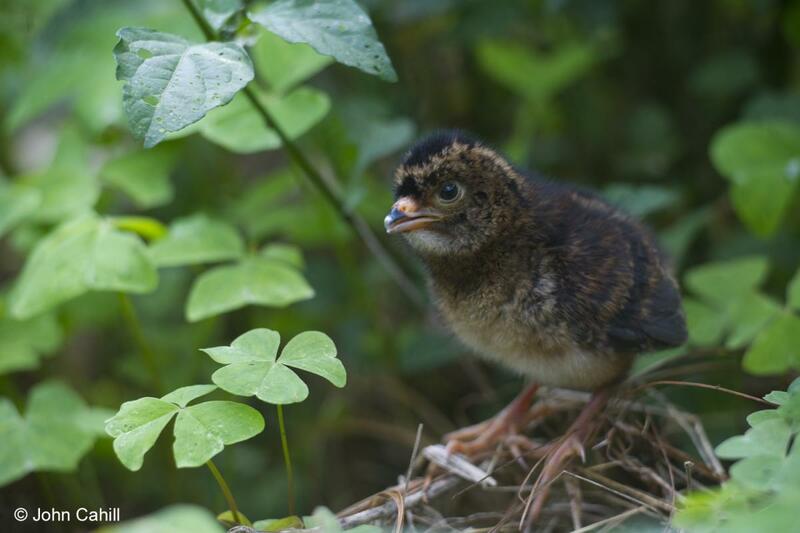 These forests are also important foraging areas for migrating birds that winter further south and pass through on their way to their nesting grounds in the north. If one had to pick the emblematic bird for the cloud forests of northern central america, one would be hard pressed to find a bird more suitable than the Resplendent Quetzal. In ancient times the Resplendent Quetzal was reverenced as the “feathered serpent,” a creature with the power to pass from over-world, through our world, into the underworld. The Resplendent Quetzal is the national bird of Guatemala and the cultural symbol of the Maya. The Quetzal represents both freedom and mystery. The Resplendent Quetzal is found only in the cloud-forests in the highlands of Central America including (Chiapas, Guatemala, Honduras, Nicaragua, Costa Rica, and Panama (Skutch 1944). The subspecies of Resplendent Quetzal Pharomachrus mocinno mocinno which lives in the cloud forests of Guatemala’s central highlands also lives in Chiapas, Honduras and northern Nicaragua. This subspecies is larger than its counterpart in Costa Rica and Panama, thePharomachrus mocinno costaricensis. The Quetzal of Guatemala also has longer plums (uppertail coverts). The specific race of the subspecies of Resplendent Quetzal which is restricted to the central highlands has been dubbed by photographer Capt. Thor Jansen Pharomachrus mocinno mocinno robustus because it is larger and more robust than its counterpart which is found along Guatemala’s western highlands and volcanic corridor. The Resplendent Quetzal does what it can for its forest. As you will learn below, the Quetzal and other cloud forest birds have a symbiotic relationship with ornithochorous trees. The Quetzal is a planter of forests. The Quetzal is a fruit eating (fructivorous) bird. It feeds mainly on fruit from the trees of the Laurel family such as wild avocados (family: Lauraceae; genra: Nectandra and Ocotea). However, when the Quetzal is feeding its young and needs to provide them with a high protein diet, it will also hunt lizards, amphibians and insects. The Quetzal nests in tree cavities. In order to nest Quetzals need standing dead tree trunks. The excavate and enlarge existing holes or make a hole in a dead tree. In order to do this they need access to dead trees with soft wood. The biggest threat to the Quetzal is habitat loss. Within the cloud forests of Guatemala’s central highlands, the Resplendent Quetzal is one of the most commonly seen birds. 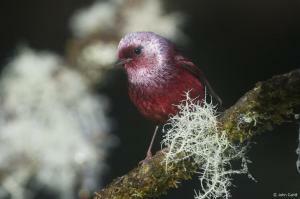 But the Quetzal is a cloud forest specialist. The equation is very straight forward. 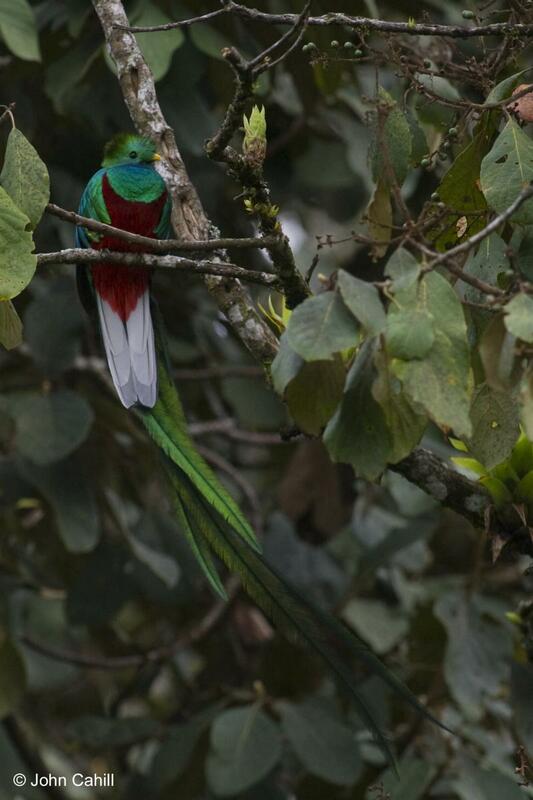 If there were no cloud forest, there would be no Quetzal. As we work to conserve the cloud forest, we do so with the future of this species in mind. Long live the Resplendent Quetzal! World Wildlife Fund (WWF) has a very concise paragraph on the birds of the eco-region NT 0303 which it lists as Critical/Endangered. CCFC’s work area is in the heart of this eco-region. Of the species listed above in WWF’s description of the highland northern Central America EBA, all but one species (Bar-winged Oriole) is found in CCFC’s work area in the central highlands. (In Guatemala, the Bar-winged Oriole is restricted to the western highlands). According to BirdLife International designation, CCFC’s focus area entirely within EBA 018 “North Central American highlands” which BirdLife International designates with a conservation priority of urgent. In fact, most of CCFC’s work takes place within two important bird areas designated by BirdLife International as IBA 007 and IBA 010. 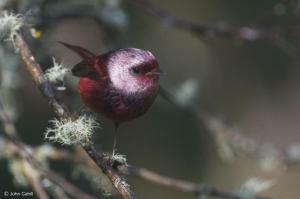 BirdLife International lists 21 endemic species within EBA 018. 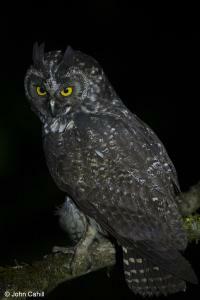 Of those 21, one is extinct and four are restricted in Guatemala to the western highlands. 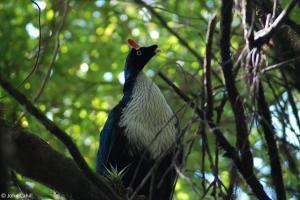 There are 16 endemic species of birds in CCFC work area in the central highland region. 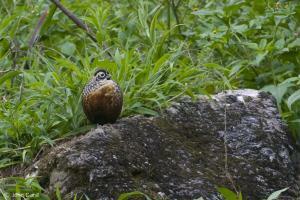 Fourteen of these endemic bird species have been recorded within 15 miles (24km) of CCFC’s agroecology center. Of the regions highland endemics, two are classified as endangered, three are listed as threatened, one is listed as near threatened. (IUCN Red List of Threatened Species. Version 2016-2). Ecologists are increasingly understanding the importance of frugivorous bird species to the natural reforestation of deforested areas. Birds are both harvesters and planters of cloud forests. Not to argue with Jesus but birds do reap and birds do sow; and birds do gather into “barns” (in a manner of speaking). Jays, crows, squirrels and woodpeckers, for example, harvest more acorns than they can eat during times of abundance. Some of these they hide in random locations, this is known as scatter-hoarding. Some of the stored acorns are found and eaten but some are forgotten. Scatter-hoarding has planted many forests. The cloud forests of meso-America, the oak and laurel trees, may have been brought here millennia ago by birds and mammals. It is fascinating to imagine the slow advance of these forests from the north American west, through Mexico, crossing the Panamanian Isthmus and eventually establishing themselves as far south as Colombia (Hooghiemstra 2006; Kappelle 2006). What is more fascinating is to picture this entire tree migration orchestrated by birds and mammals and carried out over hundreds of years in increments 50 to 100 meters. A great mystery of the cloud forest is hidden in the special relationship between the forest and its birds, or better, between the birds and their forest. Band-tailed Pigeons perch atop the forest canopy. According to studies conducted in cloud forests, between 30% and 50% of the tree and woody plant species depend on birds for seed dispersal. In those same forests between 35% and 45% of the bird species are fructivorous. Imagine, up to half the trees and plants depend on the birds for the propagation and survival of their species and up to half of the birds of that same forest depend on the fruit of the trees for their food. This is called a symbiotic relationship. Birds need the trees and the trees need the birds. The Band-tailed Pigeon is known commonly in Spanish as the Oak Pigeon for its habit of roosting on the top most tip of the oak trees. The Band-tailed Pigeon (Patagioenas fasciate) enjoys such a symbiotic relationship with the cloud forests of the Sierra Yalijux and the Sierra Sacranix. One of the Band-tailed Pigeon’s favorate foods is the delicate wax covered berries that grow on the Wax Myrtle (in Spanish: Arrayán tree) (its scientific name: Mirica cerifera). This tree is an important food source for many birds that live in the cloud forest. In the southern United States the Wax Myrtle or southern Bayberry is a small shrub-like tree. In Guatemala it is a mid-sized tree with a good sturdy trunk, not unlike a large pear tree in size and shape. The Band-tailed Pigeon shares a symbiotic relationship with this tree. The Q’eqchi’ Maya name for Band-tailed Pigeon is uut. The Q’eqchi’ Maya name for the Wax Myrtle is wa uut (translated literally the tortilla of the Band-tailed Pigeon). The Band-tailed Pigeon needs the Wax Myrtle. These wax covered berries are an important part of their diet, especially in the month before other seeds are available. The Wax Myrtle also needs the Band-tailed Pigeon. The pigeon swallows the berries whole and digests all but the kernel. The digestive system of the pigeon scarifies the seed. When the pigeon defecates, the scarified seed is ready to germinate. What is scarification? The hard protective coating on some tree seed is nature’s way of protecting the seed. But hard coats on some hard seeds actually inhibit germination because water can not penetrate the coating. For the germination of some seeds like these, nature’s answer is the digestive system of some birds. 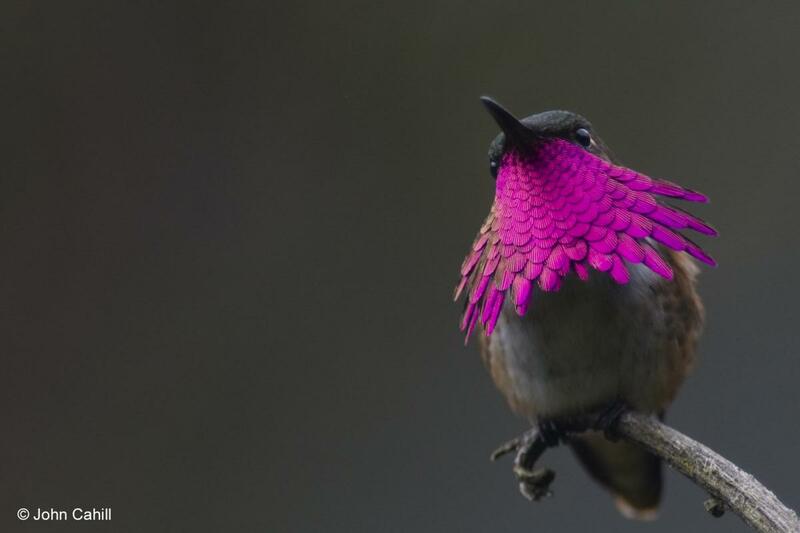 When a bird eats a fleshy seed, the bird digests the fleshy part leaving the hard kernel of the seed to pass through the digestive system or in the case of some birds to regurgitate back up. Trogons and the Quetzal eat small wild avocados. In the case of the Quetzal, small avocados make up about half of their diet. Trogons and Quetzals swallow these fruits whole, digest all but the woody kernel. The kernel then they regurgitate. Interestingly, Quetzals nest and often perch on dead trees. It is from these perches that the majority of their seed kernels fall. Laurel trees (Lauraceae) Trogons and the Resplendent Quetzal. CCFC is proud to be contributing to our understanding of Golden-winged Warbler winter distribution in Guatemala. Thanks to CCFC interns Kevin Vande Vusse (B.S. Grand Valley State University) and Autumn Young (a Bluffton College undergraduate student), in collaboration with American Bird Conservancy, CCFC has been able add another peice to the puzzle of this stunning warbler’s winter range. Golden-winged Warbler Vermivora chrysoptera found on monitoring by Kevin Vande Vusse. Not only is CCFC learning about Golden-winged Warblers through research, we are working to build awareness and appreciation of this and other species by introducing Q’eqchi’ Maya school children to the birds of the forests that neighbor them. This fall Kevin split his time between monitoring and teaching CCFC’s CALT Program students to identify and appreciate the beauty of the avian world around us. 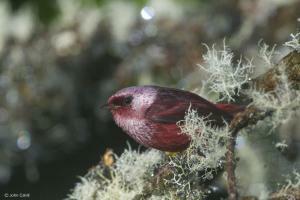 It is hard to over-estimate the importance of these highland forests to neotropical migrants. From late September to late April, the cloud forests and pine-oak-liquidamber forests of Guatemala’s central highlands are filled with neotropical migrants. Finding Golden-winged Warblers Vermivora chrysoptera in the cloud forests with Kevin Vande Vusse. We walk along a leaf covered trail under the deep shade of oaks and laurels in Chajbaok, a private reserve in Coban, Alta Verapaz. 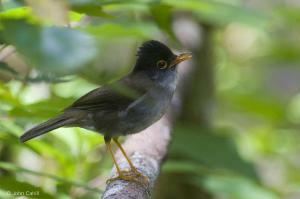 The tree tops are busy with eagerly foraging Swainson’s Thrushes. Suddenly a warbler comes into full view, a Blackburnian Warbler Dendroica fusca lets itself be seen on a branch in full sunlight. In the tree tops, the Blackburnian Warbler is acting almost like a Worm-eating Warbler as it is finding an abundance of insects among the hanging curled dry leaves. A moment later, a chip call from the understory draws our attention to a Canada Warbler Wilsonia canadensis. Blackburnian Warbler Setophaga fusca moves through in late April. north. The Blackburnian Warbler might have come from its winter home in Peru, Ecuador, or Colombia. Soon it will be making its way to Pennsylvania, New York, or Canada. The Canada Warbler will make much the same journey. Today they are fueling up for their journey. Seeing the Swainson’s Thrushes foraging in the canopy reminds us of another oddity of spring migration. Normally the Swainson’s Thrush will be seen hopping on the ground searching for something to eat among the leaf litter. As we watch them, we notice that the Swainson’s Thrushes are all feeding on insects in the canopy. As we watch these busy travelers foraging, we realize how important the ecological health of this forest is to these birds. The fact that they have insects to eat and a forest canopy in which to eat them is due to the fact that these few acres of forest are set aside in a private reserve. As Guatemala’s central highlands becomes more and more deforested, areas like this one become harder and harder for these birds to locate. Wilson’s Warbler Wilsonia pusilla wintering in the Yalijux and Sacrnix. Wilson’s Warblers May 3, 2010 con’t. Golden-cheeked Warbler Dendroica chrysoparia is globally endangered. Today in the Chajbaok reserve, we see only two Wilson’s Warblers. Most of the winter, Wilson’s Warblers are abundant here. Last month, we saw about a dozen on this same path. By now, most have gone north. In addition to Wilson’s Warblers, Townsend’s Warblers, Black-throated Green Warblers, Tennessee Warblers, Magnolia Warblers, Black-and-white Warblers, Hooded Warblers, Northern Waterthrushes, American Redstarts, Blue-winged Warblers, Nashville Warblers, Hermit Warblers, Kentucky Warblers, and Chestnut-sided Warblers all find their winter refuge in the forests of Guatemala’s central highlands. At the heart of Guatemala’s central highlands are the two mountain ranges of cloud forests, the Sierra Yalijux and the Sierra Sacranix. These two mountain ranges are considered Important Bird Areas by BirdLife International. One of the several factors that qualifies the Sierra Yalijux as an important bird area is the fact that so many of the world’s Wilson’s Warblers winter here. The first map shows the population density of breeding warblers across North America. The red area represents the highest density, dark blue next highest and so on. From the map, we can clearly see that birds of the Parulidae family (Wood Warblers) have a preference for the hard wood and boreal forests of eastern Canada and the north east United States. An important minority of the members of the Parulidae family also inhabit the conifer forests of the west, e.g. the Hermit and Townsend’s Warblers. This map shows the population density of wintering warblers. Notice the density in Chiapas and Yucatan, Mexico and across Guatemala and Belize, a sober reminder of the importance of northern meso-america to winter warbler populations. Skutch, Alexander F. 1944. Life History of the Quetzal. The Condor 46(5): 213-235. Hooghiemstra, H. 2006. “Immigration of Oak into Northern South America: a Paleo-ecological Document.” InEcology and Conservation of Neotropical Montane Oak Forests, Maarten Kappelle ed. Berlin: Springer.